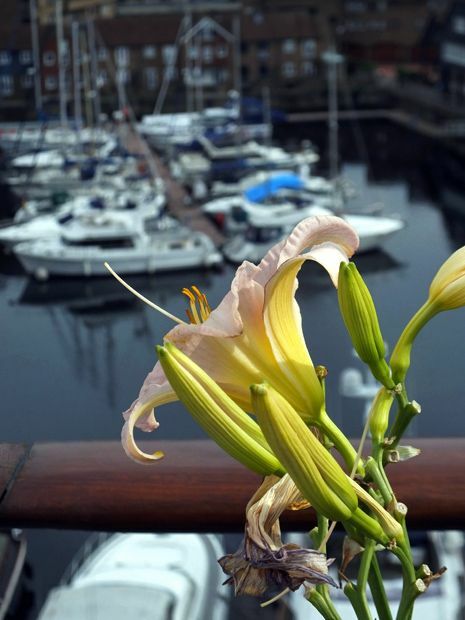 The penthouse apartments atop Star Place feature four outdoor spaces, layered into two levels within a dual aspect; overlooking the marina, their roof terraces' ambience is truly inspiring – presenting picturesque dockside views across a south-facing elevation. 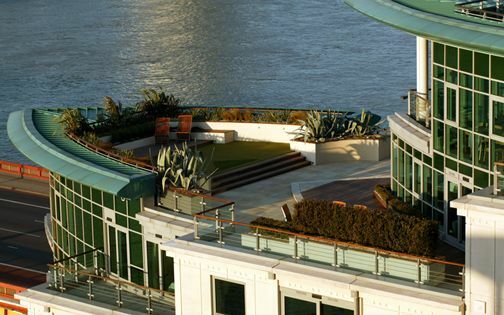 When our clients approached us to design their multilevel roof terraces, we had already established extensive roof garden projects in this waterfront development, as well as in Butlers Wharf nearby and Wapping, Shad Thames, Tower Bridge and neighbouring Southwark. 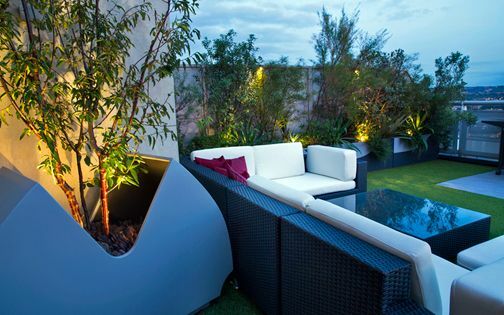 The roof terraces provided significant potential to create a scheme in keeping with a contemporary penthouse apartment, comprising clean lines enriched by scented sprawling floras – sustaining unique, intimate and highly invigorating urban roof terrace designs in a thriving London setting. A drift of Perovskia ‘Blue Spire’ energises the kitchen's roof terrace with its lofty violet stalks, aligned in perfect symmetry alongside the Shard's up-close silhouette. Although colloquially named a Russian sage, Perovskia is in fact neither, and forms wildlife friendly, graceful stems abundant in deep blue flowers during late summer. 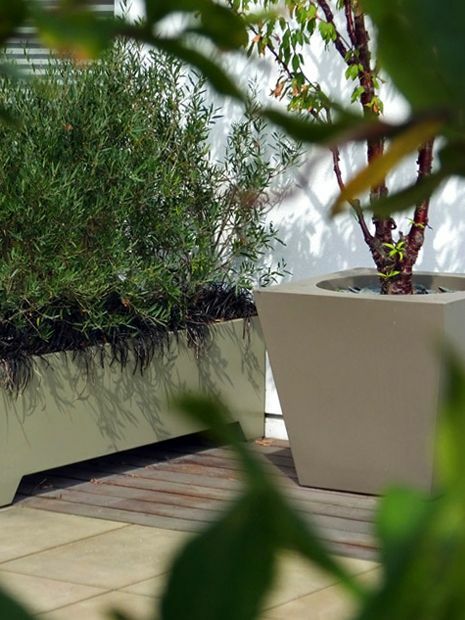 We sought to intersperse as many profusely flowering herbaceous perennials as was achievable, while sustaining a low maintenance approach within a minimalist roof terrace design layout, and this robust Sage from the Eurasian Steppe fulfils the premise with its undemanding stature – infusing inspiration in an unexpected urban location. 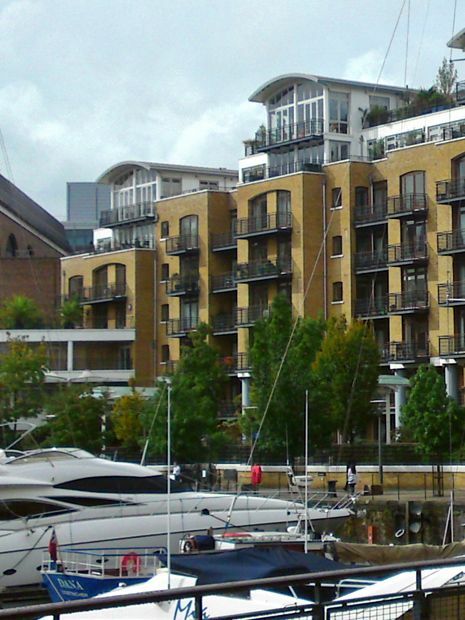 While the north terraces face the very busy and highly polluted East Smithfield, the south rooftops feature a scenic view of St Katharine Docks' waterfront. Such a distinct environment forms a unique urban setting, unparalleled in essence, history and characteristics, where on a bright sunny day, its cobbled paths, expansive tree canopies, city skyline and water's quietude, merge charmingly with iconic rooftop landmarks like no other dockside in Greater London. The renovated apartment was formed within a long works schedule, which culminated in a meticulously laid out residence, embracing minimalist rooftops with abundant daylight emanating from spacious skylights. We augmented indoor-outdoor fluidity by utilising large-scale granite flagstones to complement the interior's floor grid, while producing sheer contrast by planting a textural multitude of foliage and petals. 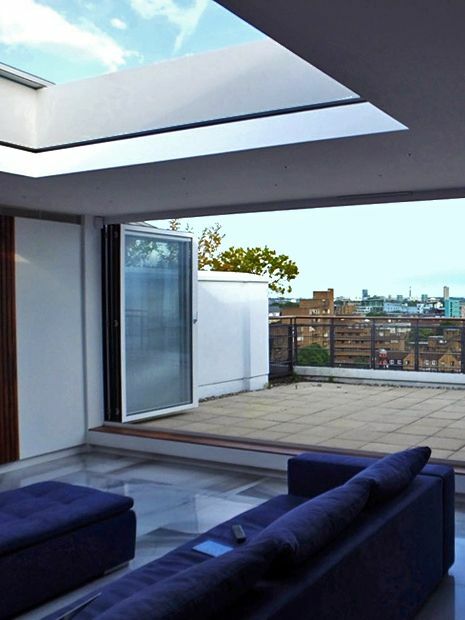 The clients sought to minimise the impact of a lengthy renovation project amid neighbouring properties. Our design & build crew transported paving materials off-site to enable a considerate construction process and moderate considerable interruption to adjacent residences – redelivering the stone once cut to size. Achillea ‘Love Parade’ produces dainty rosy pink blooms; its rounded floral plates augment a soft colour palette, contrasted by sculptural succulents. The Siberian yarrow is at home in the warm south-facing terrace and the troughs' ample drainage, where this Yarrow not only spreads the love, but also withstands the windy environment. Nestled snugly within an abundance of diverse wildlife flora, the effortlessly grown perennial sustains beneficial Ladybirds, and enriches the soil, while enhancing the flavour of culinary herbs planted among it. 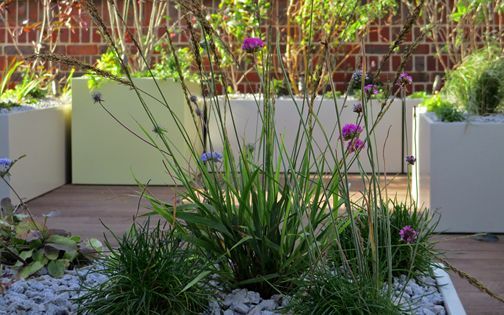 Increasingly, we seek to enhance the well-being of both our clients and their garden wildlife by sustaining natural roof terrace planting schemes, integrated into contemporary garden design layouts. 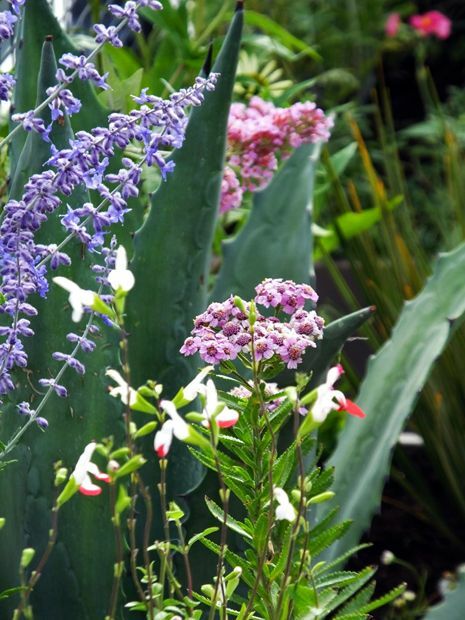 In late summer, the roof terraces nourish an abundance of insects and birds; pink, red and blue Butterfly bushes, Coreopsis ‘Moonbeam’, Echinacea ‘White Swan’, Helianthemum ‘Ben Hope’ and bounteous Penstemon varieties produce diverse textures, colours and scents which extend the growing season, and attract a multitude of local airborne fauna. 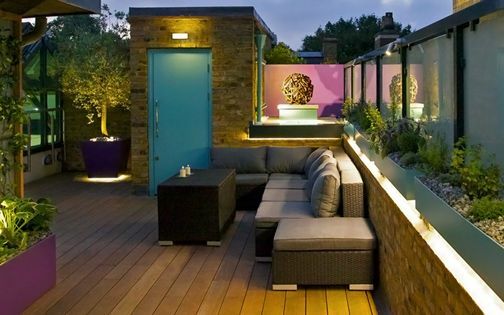 Since our clients hail from England and Mexico, we designed a cosmopolitan roof terrace planting scheme. 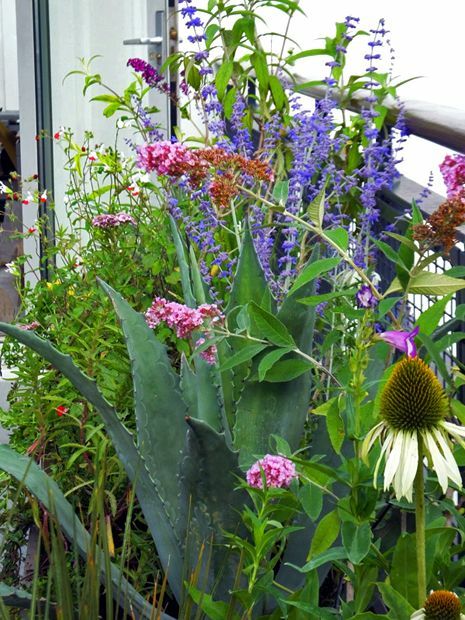 Agave, Beschorneria, Dasylirion and Salvia ‘Hot Lips’ from the Mexican deserts enfold the kitchen's terrace, while the living room's rooftop is allocated to spring and autumn colours with Anemones, Daylilies, Hellebores, Hydrangeas, Lavenders and Bearded irises. 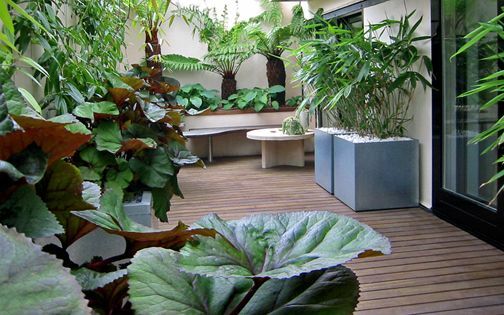 Throughout the remaining roof terraces, we integrated Birch, Camellia, Dogwood and Olive trees which sustain an architectural design, interspersed among copious herbal clusters. Hemerocallis ‘Catherine Woodbery’ is at the very apex of fragrant Daylilies. With its pale Apricot hues, this tall perennial completes our trio of Hemerocallis cultivars on the living room terrace, alongside pink and red varieties. While interconnected open-plan spaces define our clients' contemporary apartment, fused with their love of country gardens, the local urban dichotomy is unveiled in its pure, contrastive narrative of sprawling natural roof garden terraces above a spotlessly modernised marina. Enveloped by white Hydrangea, the edible Daylily blooms produce captivating displays of daily decay and renewal. Autumnal essence is at times tricky to achieve in an urban rooftop garden, yet here, where St Katharine Docks are lined with American sweetgum trees and their fiery November showcase, there's no better place to include species which elevate the latter part of the growing season. While Jasmines, Lavenders and Yarrow fade into winter mode, Anemones, Hydrangeas and Daylilies emerge above balustrades to revitalise the setting with elegant hues and a heady fragrance. 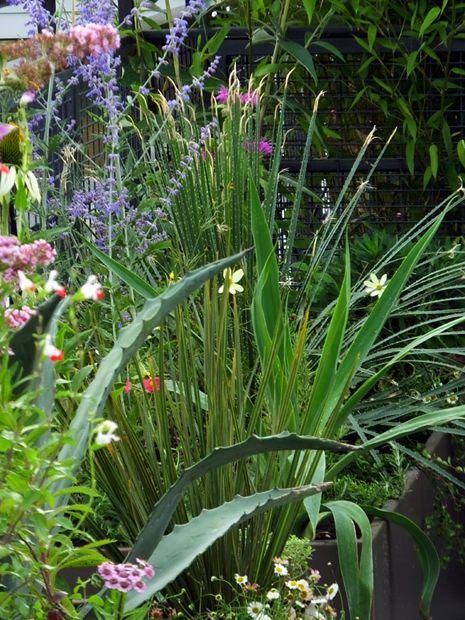 It takes time for planting schemes to mature, and designing adjacent outdoor spaces promotes a lifelong design process. 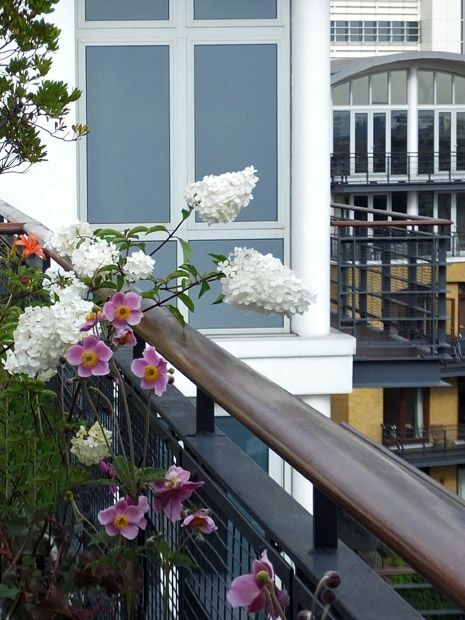 The roof terraces we previously created next door provide a lush architectural backdrop to the daintier textures in this penthouse residence. Tibetan Cherry, Strawberry and Catalpa trees complete a continuous elevation across this stretch of urban dockside bay. 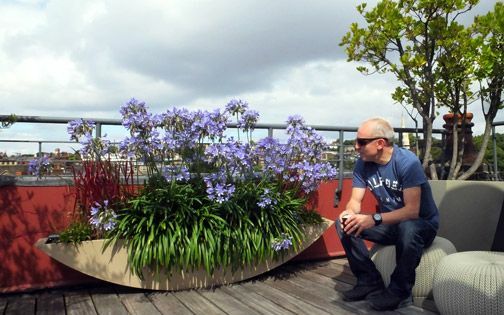 There's nothing more rewarding than to see scale evolving into its intended size, where abundant, well maintained growth is balancing our roof terrace troughs. The docks' history dates back nearly a millennium, and while WW2 had rendered the warehouses thoroughly unusable, it wasn't until the 1970's when urban regeneration began transforming these 20 acres of abandoned riverside into their current upbeat framework. 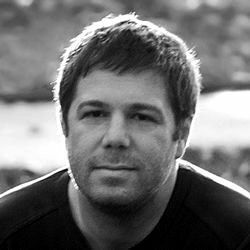 As in every global city, this myriad of penthouses is contrasted by social housing, where the presence of quaint piers juxtaposed alongside tourism and busy highways merges with the local zeitgeist. 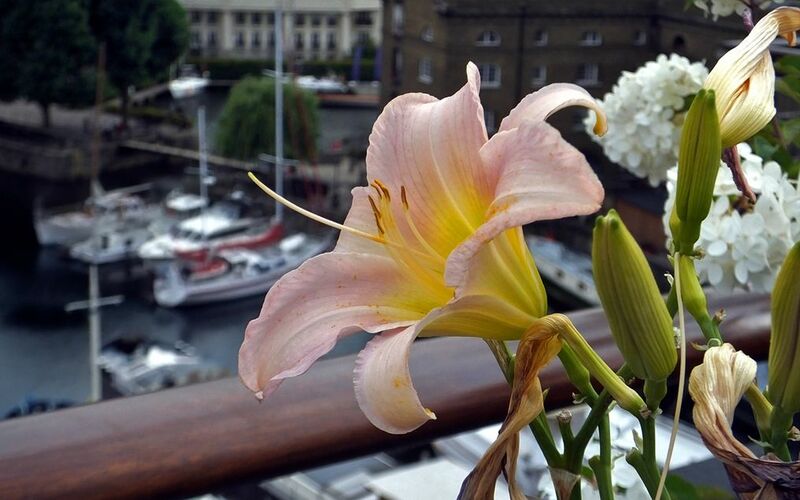 Yet, St Katharine Docks is brimming with lushness, cascading rooftops, green roof boats, tree canopies and buoyancy across its water – we love working here! 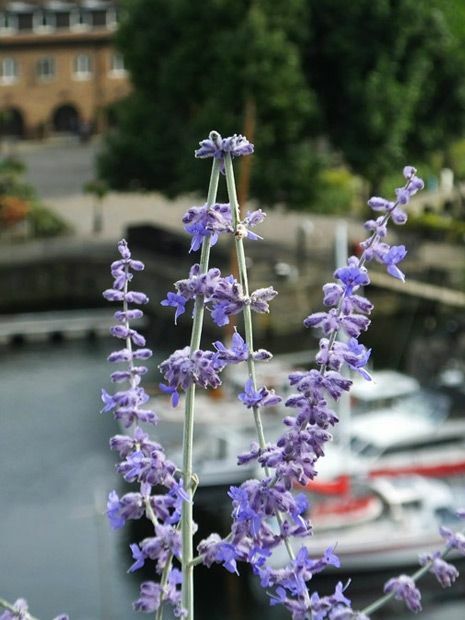 The quintessence of St Katharine Docks evokes a peaceful mindset, transmitting character in its ripply water quietude beyond the urban hustle and bustle. As London rises ever taller, forming an emergent skyline filled with skyscraper clusters in every niche and vista, this Wapping bay dockside remains a secluded, intimate and inspiring inner-city zone to relish – in a tranquil, urban state of mind.